Here's at least one thing to be thankful for: beer. As lovers of food, drink, football, and naps, we think Thanksgiving is pretty close to the perfect holiday. Of course, it's about more than just stuffing yourself and heading to the couch, and that's truly what makes Thanksgiving great. We all have much to be thankful for, and taking a day to reflect can be a needed reminder of how good we have it. Thanksgiving is also one of the best times to gather with family and friends. We may be biased, but we think these sorts of get-togethers are done best with a beer or two. Whether you're staying close to home or heading over the hill and through the woods, there's a way to make Fulton part of your celebration. The taproom is open both Thanksgiving Eve (that's today, if you hadn't noticed) and Black Friday from 3-10 for growler and pint sales. If your plans don't take you past the brewery, our restaurant, bar, and liquor store friends all across the Twin Cities are ready to quench your thirst. Whatever your plans, please make sure to celebrate responsibly. It's supposed to get cold later this week, and if history is any guide, it won't start getting warmer until about March. If that's a problem, Minnesota may not be the best fit for you. But even the hardiest of us need an occasional boost during the winter months, which is why we've been busy brewing Worthy Adversary for the last three weeks. Clocking in at 9.2% ABV and redolent of chocolate, coffee, and delicious, the Worthy Adversary makes the coming of winter seem not so sinister after all. The first pints and growlers of Worthy Adversary will be available on December 8th at the taproom, and it'll start appearing all over town on draft during the next week. The week after that, you'll be able to pick up 750mL bottles in liquor stores. As Smokey said, "Mark it 8, Dude." December 8th, that is. Holiday cards, that is. We've been lucky enough to have the support of our families through the adventure of opening a brewery. Not just our ever-patient and forgiving wives, but our parents and extended family who've jumped in along the way. 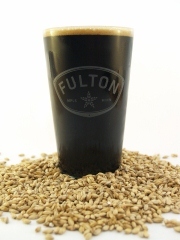 If you've taken our brewery tour, you've heard the Fulton story as told by Jim's dad, Jay. Brian's wife, Katie, works full-time managing the behind-the-scenes details of getting beer to your local watering hole. And if you've visited the taproom, chances are you've probably purchased a growler from Peter's aunt Megan, or had your beer poured by Gummy (Jim's sister / Peter's wife / Fulton's taproom manager), Elizabeth (Jim's wife) Michelle (Ryan's wife), or one of Brian's or Ryan's siblings or in-laws: Lynn, Andy, Marcus, Ali, Becca, Danny, or Brock. As our company has grown, we've hired more people who have become like family too. So, as we approached this holiday season, we thought it fitting to celebrate the growing Fulton Family with an old-fashioned greeting card. We'd love to send you our card, and we'd love to get one back from you so we can display it on the cooler wall in our taproom. 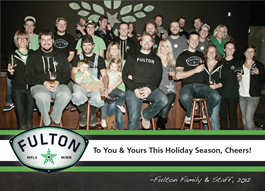 You can either send us your card, or just email your address to info@fultonbeer.com. According to some, November is the dreariest month of the year. We always try to look on the bright side, though, so we started thinking of all the good things November has to offer. The list was shorter than we hoped for, so we had to make up a few items on the fly. Here they are. Like oysters? Head over to The Lowry tonight! From 5-9, they'll be serving two special kinds of oysters they've flown in just for this event: Shoregasm, described as "tiny but mighty", and Belong, enormous 3-4" diamater oysters. To top it off, we've brewed a one-of-a-kind oyster stout to go with them! Now, we know oysters are supposed to be an aphrodisiac, but we also know the idea of an oyster stout doesn't turn everyone on. Trust us: it's really good, and the oyster flavor is extremely subtle. Get there early, because we've only made one keg--so when it's gone, it's gone for good. Pizzeria Lola is celebrating their 2nd birthday this week. We're huge fans of Lola, because it's located just blocks from where we started homebrewing and because Ann Kim's crew makes pizzas that are to die for. This Thursday, we'll be there with habanero-infused Lonely Blonde, which will be paired with a Virgin Mary (think "backwards Bloody Mary"). Should pair beautifully with virtually any pizza on the menu. Thanksgiving is nearly upon us. We hope everyone has a long list of things they're thankful for this year. In case you don't though, here's at least one: we'll be opening the taproom from 3-10 on Wednesday, 11/21. Thanksgiving Eve is one of the biggest nights of the year for bars and restaurants, so why not spend it at your favorite downtown Minneapolis brewery? We'll have a cask pouring, and you'll be able to pick up a nice gift for your Thanksgiving host. Hint: growlers make a much better gift than flowers. The taproom will be closed on Thanksgiving Day, and normal hours will resume on Black Friday at 3:00.